Groesbeck Parham, MD and Charla Chibwesha, MD, MSc (shown here with Susan Banda, NP) lead an extensive outreach and screening program for cervical cancer in Zambia. The Center for Infectious Disease Research in Zambia is home to one of the largest cervical cancer screening initiatives in the world. Groesbeck Parham, MD and Charla Chibwesha, MD, MSc (shown here with Susan Banda, NP) lead an extensive outreach and screening program for cervical cancer in Zambia. Both hold faculty appointments in the UNC division of gynecologic oncology. While working on renovations at Ngungu Health Centre in Kabwe, Zambia in July 2012, Dr. Parham got some help from former President George W. Bush. The president was traveling to the continent in support of his Pink Ribbon Red Ribbon campaign to prevent cervical cancer. Groesbeck Parham, MD is Director of the CIDRZ Cervical Cancer Prevention Program and professor of gynecologic oncology in the department of obstetrics and gynecology at the University of North Carolina at Chapel Hill. A board-certified gynecologic oncologist, Dr. Parham completed his obstetrics and gynecology residency at the University of Alabama at Birmingham, urogynecology fellowship at the University of London and Khartoum Teaching Hospital in Sudan, and gynecologic oncology fellowship at the University of California, Irvine. 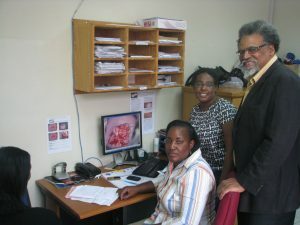 Dr. Parham moved to Lusaka, Zambia in 2005 to establish the CIDRZ Cervical Cancer Prevention Program. Before moving to Lusaka, he served as director of the divisions of gynecologic oncology at Charles Drew University of Medicine and Science (Los Angeles, CA) and the University of Arkansas School of Medicine. Carla Chibwesha, MD, MSc, is assistant professor of gynecologic oncology in the department of obstetrics and gynecology at the University of North Carolina at Chapel Hill. She completed her fellowship in International Women’s Health at the University of Alabama at Birmingham. She earned her MSc at the London School of Hygiene and Tropical Medicine and her MD at Brown University. She completed her residency training in obstetrics and gynecology at Brown University. Since returning to Zambia in 2008, she has actively pursued her research interests in cervical cancer control, family planning and prevention of mother to child transmission of HIV. A former Fogarty International Clinical Research Fellow, Dr. Chibwesha currently spearheads a CDC-PEPFAR-funded initiative to reduce maternal mortality across two Eastern Province districts in Zambia.